For years, the HIT industry has pondered whether interoperability was achievable, and it's still working to answer that question. One organization focused on the interoperability effort is The Sequoia Project, a nonprofit that advances the implementation of secure, interoperable nationwide health information exchange. It manages interoperability initiatives such as Carequality, which is a collaborative to promote seamless data exchange among networks, and the eHealth Exchange, which is the largest health data sharing network in the United States, enabling participants to securely exchange information under a common set of standards. 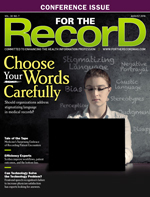 To learn more about The Sequoia Project's goals and the challenges of interoperability, For The Record (FTR) speaks with CEO Mariann Yeager, who also has worked on nationwide health information network initiatives for the Office of the National Coordinator for Health Information Technology (ONC). FTR: Earlier this year, The Sequoia Project released a white paper on patient matching issues. What type of feedback have you received since its release? Yeager: We first released this paper about two years ago for public comment. We were thrilled to receive vigorous engagement and thoughtful feedback from members and nonmembers alike. A diverse taskforce was formed to incorporate this feedback, and the result was this year's revised paper. The paper, freely available to the industry, includes actionable insights to help data sharing partners dramatically improve their patient matching rates. FTR: What's the relationship between patient matching and interoperability? Yeager: Patient matching is critical to effective interoperability. It's necessary to be able to trust that you are accessing the right patient's records. A mistake there can be life altering. FTR: What's your opinion of the Trusted Exchange Framework and Common Agreement (TEFCA)? Yeager: We support the goals of the TEFCA, and ONC's stated intention to leverage existing work and standards in the private sector. Our public comments on the draft [trusted exchange framework] focused on the practical implications of the proposal based upon our experience supporting nationwide networks and interoperability frameworks at scale. FTR: How does TEFCA differ from other interoperability initiatives? Yeager: TEFCA is government driven and covers a broad range of functions and use cases, some of which exist and are broadly implemented today and others that address new interoperability use cases and capabilities. FTR: What are the underlying issues making interoperability so difficult? Yeager: Interoperability sounds simple, as we expect it to "just work" after experiencing it in other industries. For example, banking. You can get your money from [an] ATM, no matter what bank you use. Likewise, the cell phone carriers like Sprint and AT&T have worked together to allow you to call across town or across the country without thinking about who is in your network. These industries worked for decades to make this possible. In health care, we've only gotten most doctors on EMRs in the last 10 years. So while we are actually moving very quickly, we started in a different place digitally than those other industries. The challenges to interoperability in HIT are vast, from digital adoption to patient matching to privacy to technical issues. It is a long list that we are methodically knocking out. FTR: Are health care organizations reticent to share data with one another? Yeager: We find that this is an outdated view of health care. In the past, a hospital might have been paid to keep their beds full and so there wasn't a business incentive to make it easier for patients to change doctors. With the shift to value-based payments, this is just no longer the case. Health care providers need to know where their patients are and get a comprehensive medical picture, which means sharing health data more widely. FTR: How have "information blocking" efforts fared? Yeager: Information blocking was a hot topic for many years, but we need to recognize that significant progress has been made with nondiscrimination (ie, no blocking) rules in place among the largest health data sharing agreements, such as those used by the eHealth Exchange and Carequality. As business use cases and value-based payments evolve, we will see less and less data blocking. FTR: Apple, Google—what do you make of their efforts to promote interoperability? Yeager: Interoperability is big challenge that requires broad collaboration. We welcome everyone to the table. FTR: What role would you like to see the federal government play in promoting interoperability? Yeager: The federal government can play a role in providing the right incentives to support interoperability and existing frameworks that already interconnect health information networks. Carrots are more effective than sticks when the industry is already working diligently to solve this problem for all providers and patients. FTR: What are your thoughts on the Centers for Medicare & Medicaid Services (CMS) proposal to make data sharing a requirement of Medicare and Medicaid participation? Yeager: We applaud the CMS's good intentions and support for data sharing. You can see our public comments on the proposal at https://bit.ly/2LmCy0y. FTR: What are some of the hurdles faced by Carequality? Yeager: We are pleased with the dramatic growth of Carequality, with more than 50% of all doctors in America connected in less than two years. The next challenge is ensuring physicians know about this connectivity and are incentivized to leverage it.